It's difficult to realize that the 1955 Annual Statewide Festival in Sacramento would mark the tenth anniversary of these events. 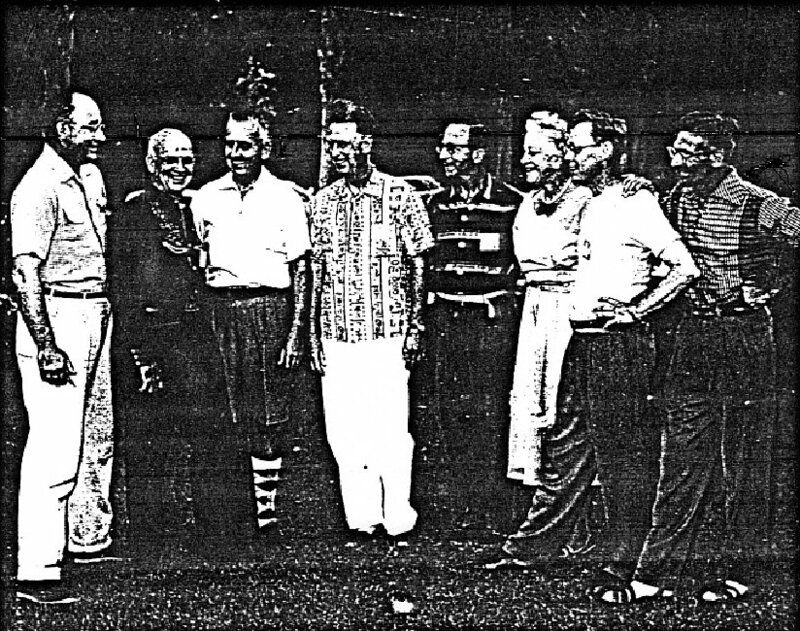 Seems like only yesterday but much has happened since we danced on the streets of Ojai in 1946. This year the Festival is May 27, 28, 29, and 30, 1955. The square dancers have their organization fairly well establshed now and no longer are very active in our Federation but we have gained a new movement--Kolo or line dancing. No need to worry about a partner to participate in the dance, just jump in and throw all caution to the wind. John Filcich's dream has finally come true and dances from the Balkans and line dances from Israel are here to stay. The folk dance movement in Sacramento is very strong and has good city support. The latter made available for Festival use, the beautiful Memorial Auditorium at 16th and L streets. Hotel Senator, at 12th and L, is Statwide headquarters and where registration will take place most of the time. It is but a short ways from the hotel to the Auditorium. 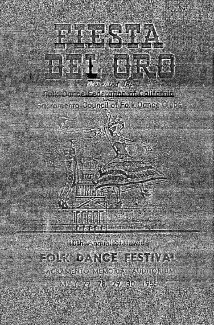 Because there is an excellent rapport between square dancers and folk dancers in the Sacramento Valley, the Friday night party at the Auditorium was scheduled as a Square Dance Jubilee, open to both folk and square dancers. It was well attended. The Teacher's Institute was scheduled for Saturday afternoon but for those not interested, there were several other options. There was an all-day trip through the gold country, or a visit to Sutter's Fort, along with several other short sightseeing trips. But, starting with Saturday night, enough dancing was scheduled to satisfy the most ardent dancer. The Saturday night program, starting at 8:00 p.m. and ending at 12:00 midnight, offered several sets of exhibitions with Millie von Konsky as master of ceremonies. A new name appears in connection with the exhibitions, that of Anatol Joukkowsky, instructor of an exhibition by Changs International Folk Dancers of San Francisco. Anatol would be heard from many more times in the future. We rushed directly from breakfast to the Auditorium for the Sunday afternoon Festival and were surprised to find as guests, Governor and Mrs. Earl Warren, dressed in their Early California costumes. Something new was added for the hours between the Sunday afternoon party and the evening Festival, a Kolo Hour from 6:45 p.m. until 8:00 p.m., conducted by John Filcich. 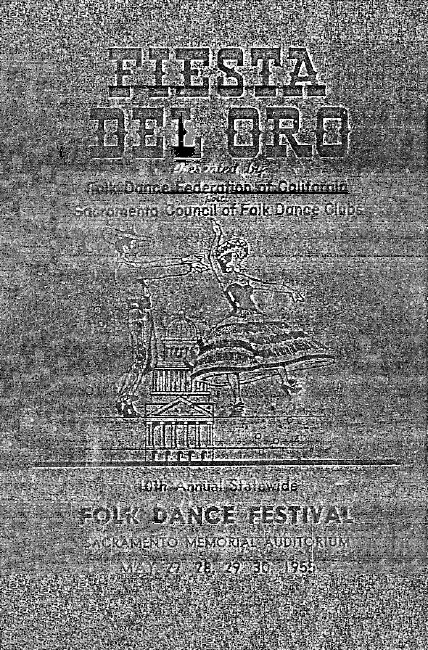 Kolo dances did not appear on any of the regular Festival Programs but this would soon change. The Sunday night dancing lasted until 12:00 o'clock midnight with the inclusion of several exhibitions. For those who did not have to leave for home, there was dancing Monday afternoon from 1:00 p.m. to 5:00 p.m., winding up another great Statewide. Walter Grothe, Lucile Czarnowski, Ed Kremers, and Buzz Glass. Missing from the first six (Buzz Glass to Larry Getchell) is Clarice Dechent (Wills). Between George Merton and Bev Wilder there were several other Presidents.